Bad news travels fast. I’m afraid I spread it around sometimes too. It’s hard not to have an opinion and air it – especially when it comes to religious fundamentalism. We’ve been seeing just too much of it in recent times. Religion instead of bringing security to our lives, seems to make us so insecure that we’re willing to forego our humanness to defend the ‘gods’ we believe in. It’s often easy then to forget the stories that don’t really make the headlines or the positive ones that do. When I read of two separate incidents of Sikh young men, willing to take off their turbans, a symbol of their religion, in the service of another, I knew I had to share them. You might like to read about Harman Singh in New Zealand who took off his turban to cradle the head of a child injured in an accident. Closer home, and more recently, two Sikh men used their turbans to rescue four boys from drowning. Sikhs by practice, remove their turbans only in the privacy of their homes, but all three men said that their actions were an instinctive response to a human need. They didn’t stop to check the religious beliefs of the people they were assisting. Humanity won over religious beliefs. Then there’s the story of 17-year-old Malyk Bonnet, a young man in Canada, who went out of his way to aid the escape of a woman from her boyfriend who was abducting her. Read about this young hero here. My husband who celebrated his birthday this month. I’ve learned never to take love and understanding for granted. I’m grateful for our relationship that allows both of us to be ourselves. My family for their concern and support. All those who make our lives easier by their hard work and diligence and who never cease to inspire me with their ability to be grateful for what they have. My many blogger friends for their support and encouragement. Special thanks to those who by their authenticity challenge me to be more authentic in my relationships and writing. The irritations and challenges of life – which ground me and make look inward more. For friends who are just a phone call away. For laughter and good humour that make life so much more interesting. For health of body and mind and the resources to be able to afford medical care when we need it. For good food and the convenience of a fresh market down the road. Our Gratitude Circle post is a regular feature on the 4th Thursday of every month. Join Vidya Sury and me by writing a gratitude post and linking in to us and adding your linky to our Gratitude Circle Hop post. The linky is open for a whole month. Add this pretty badge to your post/ site and visit and read the other posts linked. Life is so much easier when you can come from a place of gratitude. Lovely piece Corinne! Kanya is such an inspiration. I loved her confidence and the honesty in her eyes. Your post is beautiful Corinne and that quote adds to the message that you are sharing. Life is a long game and unless we are grateful for what we have, we can’t stay happy. Your list is a reminder of that. Beautiful! What a beautifully written post. Reading this made my day. Agreed that we should always have a sense of gratitude! Gratitude is one of the most powerful attitudes we can express in life. What a beautiful and inspiring post Corinne! Thank you for sharing and I will be sure to link up to your Gratitude Circle next week! It’s true! I believe attitude and gratitude are some important pieces to making your life happy. Thanks for sharing the “no legs, no limits” story. She’s amazing and she has great “attitude!” I’ll have to participate in the Gratitude Circle next month. I’m pinning the Dandelion quote too!! I love this post and the stories you told of the men acting instinctively to help others. You write with such warmth. Great post! Very inspiring. I will have to follow the circle. Loved all the quotes and most of all the dandelion quote. It made me stop and think. Thanks so much. Beautiful post, Corinne, and the dandelion quote is wonderful. What a positive way to look at life! I love that you’re focusing on the good. Gratitude builds hope and that’s something we all need. there’s is so much in life we take for granted and we forget to stop and appreciate the many blessings that we encounter every day. Even having legs is such a bonus – but obviously not a complete setback! “No legs, no limits” WOW, so inspiring! I have nothing to complain about!!! Thanks for a lovely post Corinne. I am thankful that I was born into a culture that teaches the values that you talk about. I wonder what I would be like if I was born into a culture that taught the value of violence and hatred. It seems that the cultures that teaches the good values that we cherish get polluted by the other. The war of good and evil continues. The news channels hardly give positive news where people go beyond their religious beliefs and do good for humanity. It is always some or the other scandal they telecast. It is worth a message to share anything good and positive happening around us, blowing it out of proportion thereby letting people believe that goodness and humanity are not lost traits in today’s times. Wow! That no legs, no limits girl is pretty amazing. She seems so cool and confident. She’s gorgeous too. Thanks for sharing info about those great people who gave importance to humanity than religion. Great gratitude list Corinne.. I love that quote by Saroyan. I often lament that the news pretty much only focuses on bad claiming that’s what sells. I don’t think that is true – I think good news is far more heartwarming and people really want to read it. I like the bits you brought out about the men helping others. Being a purveyor of good news (and gratitude) is vital in this very negative world!! My soul feels so lifted when I read your work, Corinne. You inspire and empower me and make me feel good about life and the blessings in them. What a gorgeous post. I thank you for writing it and for being exactly the person that you are. Bless you. What comes first hope or gratitude? I need them both in equal measure. I’m thinking gratitude – helps to build hope! Wishing you grace, hope and gratitude, Beth. Seeking goodness in all things with a grateful heart, Corinne. Blessings, my friend! Right, Martha! Wishing you well. 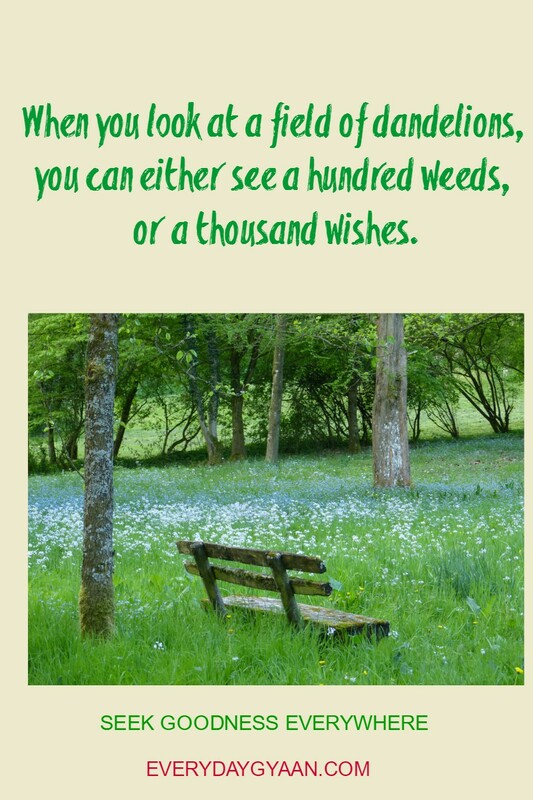 I love that dandelion quote so much! Those stories are sad. In fact, my son’s participating in a debate about religion vs humanity this week. So did I. I deliberately steered clear of the sad stories – too many of them around.